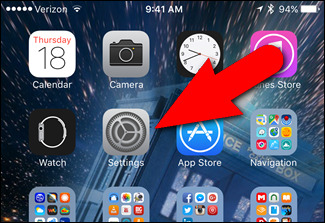 When you tap a key on the iOS keyboard, it will “pop up” so you know what key you’re pressing. 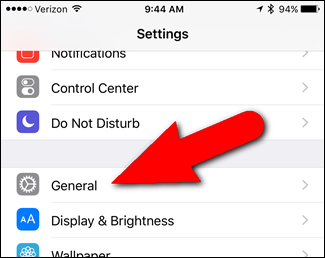 This preview has long been a feature that you had to live with whether you liked it or not, but in iOS 9, you can disable it. On the “General” screen, tap “Keyboard”. In the “All Keyboards” section, tap the “Character Preview” slider button so it turns white instead of green. Now you won’t see the character popups when you tap keys on the keyboard. The ability to turn off the character popups is also a security enhancement. With the “Character Preview” setting on, anyone who can see your screen while you’re typing can more easily see which keys your tapping. Turning off the setting will better mask your keystrokes. 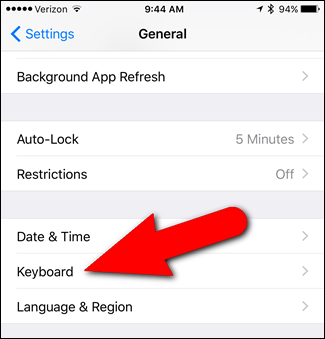 There are several other useful settings for customizing the iOS 9 keyboard, including re-enabling the old upper-case touch keyboard, disabling the keyboard suggestions bar, and disabling the keyboard sounds. 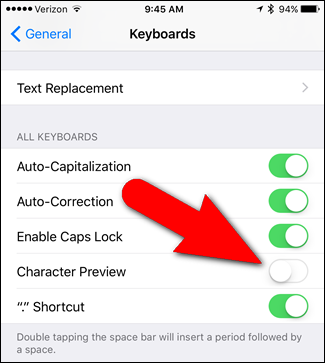 You can also learn the not-so-obvious trick to using caps lock on the iOS 9 keyboard.